Direct gas fired heaters for drying applications. The combustion chamber is coated with high alumina content refractory materials. The gas to be heated passes through a coaxial gap to the to the combustion chamber and mixes with gases in the mixing chamber to attain the desired operating temperature. Monobloc configuration complete with burner, control panel, instrumentation and safety devices mounted and wired as completed packaged unit. The hot gas heater is ready for site installation and connection to services. The combustion air delivery can be either forced positive draught or induced negative draught to suit the application requirements. 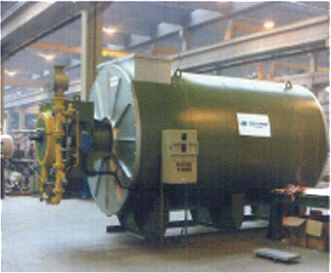 Integral and proprietary burners of many types and configuration can be utilised with this design of heater. Maximum gas outlet temperature to i200°C. Air circuit pressure drop 20 – 30 mm W.C.